Buy 20 or more for $23.74 each. The art of preaching is one of the most important acts of ministry. A sermon teaches. It challenges. It convicts. 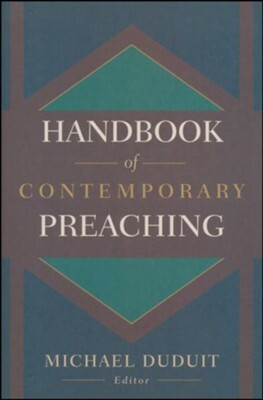 The Handbook of Contemporary Preaching is exactly thata handbook. It has been designed to be a permanent resource to be referred to time and time again. Many facets of sermon preparation and delivery are addressed here, including methods of preaching, preaching and other pastoral roles, theology of preaching, and creativity in preaching. With its expansive bibliography and accessible format, it will become not only a valuable part of your library, but an important tool in assisting you for years to come. Michael Duduit is founding dean of the College of Christian Studies and the Clamp Divinity School at Anderson University, executive editor of Preaching Magazine. I'm the author/artist and I want to review The Handbook of Contemporary Preaching: A Wealth of Counsel for Creative and Effective Proclamation.